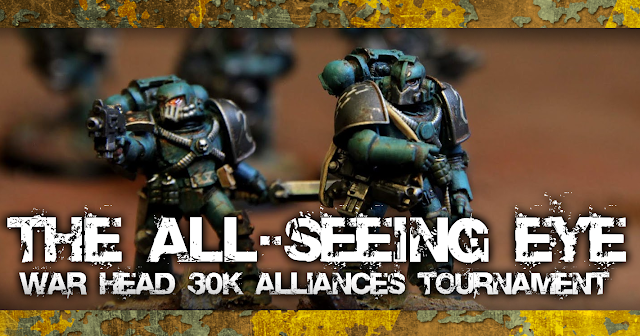 War Head invites all international Praetors to participate in our Horus Heresy: The All-Seeing Eye tournament! The Alliances format is one of our oldest tournament traditions and will be used in the Horus Heresy environment for the first time this year. The tournament is entirely beginner-friendly and aimed towards casual fluff players who appreciate beautiful models and gaming narrative over competitive crunching. All players are divided into two Alliances, which then compete against each other under the guidance of their chosen Commandant. Each table has a custom scenario and some of your actions can also affect other ongoing games - supporting your Alliance is the key to victory! All tournament points are added to player's Alliance's points total, and the side with more points after three rounds of play is crowned the conqueror! The tournament is arranged at Poromagia / War Head store in Opastinsilta 7 B, Helsinki. If you have any questions, you can contact us via War Head Facebook, or at contact@gowarhead.com! - Games are played with Horus Heresy and 40K Seventh Edition rules. - Both Alliances (Loyalist and Traitor) can include a maximum of 10 players. - Entry fee of 15€ is paid upon arriving. - The models used don't have to be constructed out of Forge World parts, but they have to be Horus Heresy -themed (for example the power armours should be mostly of old design or at least feature exotic parts). Most 40K armies are not representative enough to be fielded in 30K as they are and players should uphold the Horus Heresy narrative with conversions or official models. - All models should be painted, based and wysiwyg when it comes to special wargear and armament. All grenades, close combat blades etc. don't need to be visible and the rule of cool applies - if it's cool and you've put effort into your models, we won't be too strict. If you have any questions, please email us at contact@gowarhead.com. - All army lists need to be delivered in advance (1st of February the latest) in the format provided here. - Sign up by sending your name and chosen army to contact@gowarhead.com! - We use the latest versions of Horus Heresy rulebooks. - We use Age of Darkness armies of no more than 2250 points. - Army may include one "main detachment" and one Allied Detachment. - Army may include a maximum of one Lord of War choice. Single Knights are permitted. - Relics of the Dark Age of Technology are forbidden. - Imperial Militia and Solar Auxilia are permitted. - Fortifications are permitted apart from Primus Redoubt, Castellum Stronghold and Fortification Networks. - Word Bearer Daemon allies use the 7th Edition Codex: Daemons as it is. - When building an army one should avoid multiplying same units and aim towards a balanced and versatile force. Especially indirect-firing Phosphex weapons should be avoided. Try to work without competitive choices, such as including both Flare Shield and Armoured Ceramite on your heavy tanks. Be a gentleman!